And, so, the Soumak Pouch Weave Along draws to a close with a very long video on finishing techniques. 9- Stitching the edging cords to the pouch – in the video, I show how to add things like large beads at the ends and center of the cord, as well as the swivel clip hook. 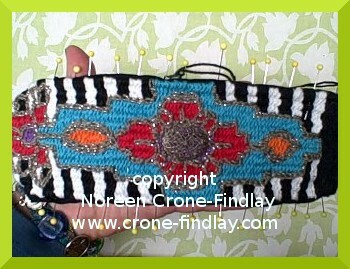 I also show how to stitch size 8 seed beads to the edging to embellish it. You don’t have to add these extra flourishes, but I thought that it made sense to show you how to do it so you ~could~ do it, if you want to. It’s the embellishments that make the pouch the truly individual statement of your creativity!